Noelle's Story. Jindo lost for a year then reunited with her family. 2013 started out with a amazing rescue. In January of 2013 Treasured k9s pulled a senior Jindo from the Manhattan AC&C. Little did we know what a special girl she was. As it turned out, Noelle ran from a multiple car accident on Interstate 95 in White Marsh, MD back in August 2011. She and her owner were traveling home to New Jersey. Noelle developed a loyal search party in White Marsh, MD and people continued to look for her. Noelle's nearly 17-month-long saga ended with a joyous conclusion! Through FaceBook, her search party was able to identify that the dog we had in foster care looked remarkably similar to Noelle. 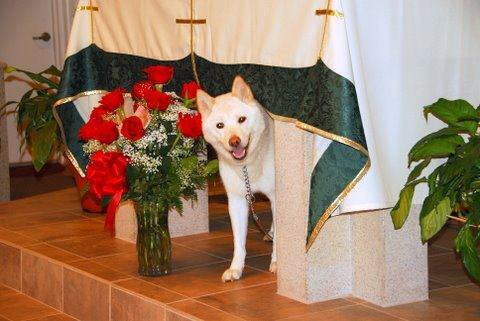 On January 16, 2013 Treasured k9s reunited Noelle with her owner Rev. Lou Scurti. Read the Baltimore Sun Article. Sadly, Noelle crossed over the rainbow bridge on March 2, 2013. She continued to lose weight and her energy level declined. She clearly was happy to be home after her long journey. Noelle was a sweet girl and we are happy she found her way home. The day Fr. Lou was reunited with his beloved Noelle.